As soon as you load this online slot up you know from the intro movie that it’s a well-crafted affair; grave robbers, lightening, black clouds and a scary mansion on a hill await you before the game even starts. This is Frankenstein, a Net Entertainment release based directly on the Mary Shelley book and featuring Dr. Victor Frankenstein and his famous monster. This is a five reel slot with twenty paylines and it’s all set inside Dr. Frankenstein’s laboratory; chains and experimental apparatus line the walls of this stone-built room. 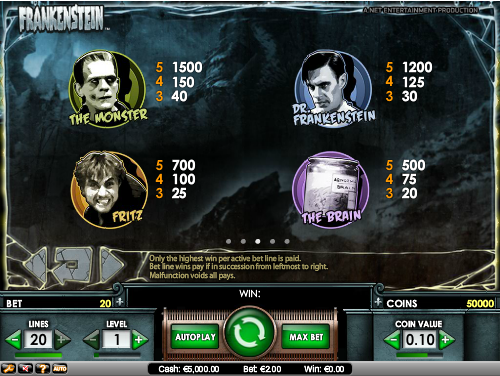 The low value symbols are represented by playing cards but higher up the ladder we have a brain in a jar, Fritz the servant, Dr. Frankenstein and finally his monster. Special symbols include a windmill scatter and a lightening wild. This symbol is represented by a silver disc and if it lands on reels two, three or four it will arc out and turn two or more adjacent symbols into additional wilds. 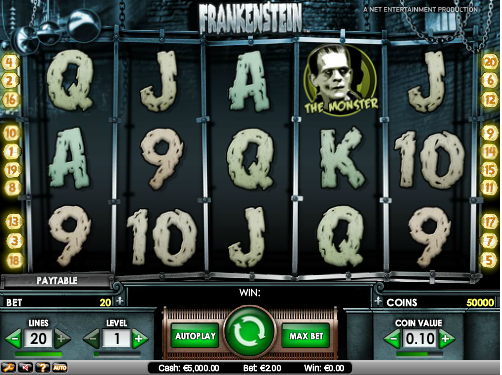 Frankenstein features a free spins round and you can trigger this by landing three or more windmill symbols anywhere on the reels in standard gameplay. You’ll now get ten free spins and within this round landing two or three more scatters will reward you with five or ten extra spins. While the free spins are underway a multiplier appears on reel five and if it lands the frees spins multiplier will increase by one to a maximum of five. Reach five and the multiplier will be removed from the reels. There’s also a fire wild feature during this bonus round and this replaces the lightening wild feature that occurs in the standard game. The even better news is that a fire wild is guaranteed on every spin of the reels during the bonus game. This is yet another great slot from Net Entertainment; the graphics and the animations look great, the sound effects fit with what’s happening on the screen and the free spins round seems to be really profitable – give it a go!